A refractometer is used to measure the density of a solution, in our case how much malt sugar is in solution. Our refractometer is unique in that it features both a Brix Scale and a Specific Gravity Scale, the scale most homebrewers use. Why use a Refractometer you ask? Are you tired of not hitting your desired target gravities? Have you tried to cool a large sample so you could use a hydrometer and see what your gravity is? A refractometer allows you take instant gravity readings, with just one drop, at any point during the boil, or even during the run off of the sparge during an all-grain brew. These 'during the process' readings allow you to add more water or boil longer so you can attain exactly the gravity you desire. 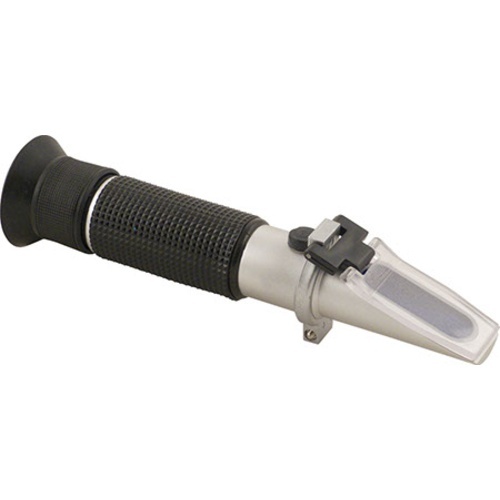 Our refractometer is hand held with a metal body, flexible eye piece and rubber grip. It features a 0 to 32% Brix scale and from 1.000 to 1.120 on the Specific Gravity Scale with .2% resolution and ATC (Automatic Temperature Compensation). Traditional refractometers without ATC are calibrated to work at 68 degrees Fahrenheit. The ATC function allows you to use the refractometer in an ambient temperature range of 50-86 degrees Fahrenheit (10-30 Celsius.) Because your sample is just one drop, and will quickly adjust to the temperature of the refractometer, the temperature of the sample is irrelevant. Our unit also comes with a manual calibration knob that is secured with a lock nut. To calibrate place one drop of distilled water on the testing platform and adjust to zero if necessary. Some dual scale refractometers feature a linear scale that multiplies brix by 4 to get Specific Gravity. This is okay at lower gravities up to around 1.040 but the higher your starting gravity goes, the less accurate the conversion is. For example, take a Brix reading of 10, multiply by 4, and you get a SG reading of 1.040 - the accurate SG reading is 1.041. Take a Brix reading of 20, multiply by 4, and you get 1.080 - the accurate conversion is 1.084. We worked with our Refractometer manufacturer to create a unit with a non linear conversion and thus this model can be accurately used for Specific Gravity readings. NOTE - Refractometers will not read correctly if alcohol is present. We have a spreadsheet that can be used to help determine your actual gravity or brix, and this can be found in the "Documents" tab above. The MT706 was hard to read. Hoping this model is better. My son-in-law(I turned into a homebrewer) was wanting a way to check gravity at any temp, so I figured this was the perfect gift. I want to test beer gravity without wasting beer volume. A friend has this and likes it. To check Brix reading on wine samples; currently using SG. My husband told me to get it. To get more accurate reading without waste. Also I like gizmos. Want to get better readings before boil ends. Easy to use, accurate, doesn't waste your beer. Picked this up after trying to use a thief and hydrometer for gravity measurements. This is so much easier, I can imagine using my hydrometer over it ever again. Requires just a few drops to get a measurement, and since it is such a small volume, the temperature of the sample will cool to room temperature very quickly. 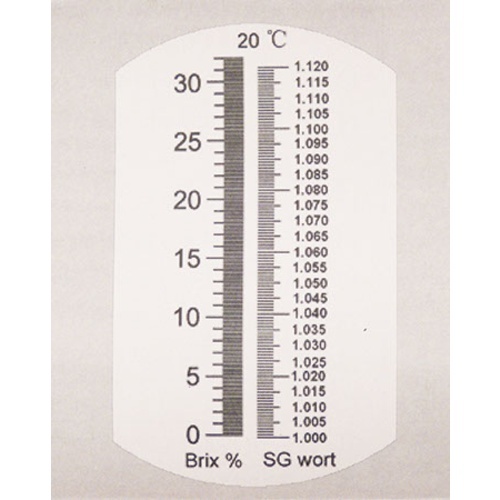 The dual scale is very easy to read and comes in handy to know both Brix and SG for the OG and to make corrections for EtOH during/after fermentation. Easy to calibrate with a set screw on the unit and a few drops of distilled water. The price was right and I like the dual scale feature. Works as expected, very easy to use. Great deal on a nice refractometer. Only takes a few drops of wort vs a 1/2 cup or so with a hydrometer. Same reading as with the hydrometer, but much easier and faster. Works great. Lines are easier to read than my old refractometer. Love the SG scale is independent of the brix one. Seems to function well but difficult for wearer of strong glasses. Seems to work well. Just recently got it so it’s accuracy hasn’t been repeatedly tested against my hydrometer. It gets 4 stars instead of 5 because although it focuses well I wear glasses & with the distance from my eye only a portion of the lens is clearly focused- blurry around the edges, making it difficult to read the numbers. And without my glasses, with the instrument right up to my eye, the adjustment doesn’t turn far enough to bring it into focus. It is still usable but this is a big drawback for someone reliant on glasses with strong corrective lenses. Easy to read with proper lighting. I like the dual scale with both brix and gravity saves me from having to calculate one or the other. Quick gravity readings without taking a big sample. I haven't touch my hydrometer in years. Can't get any better than this. Easy to read, durable, dependable and accurate. I use it in the field and in the shop regularly and check it against other instruments occasionally and do the math. Had it for four seasons now and still ticking. Will buy another when it passes. works well but wish the instructions mentioned that you cant use it for post fermentation. I probably would not have bought it had I known. I really like this dual scale. T'was always a bit of a pain to have to do the conversion. economy tool that should replace most hydrometer in being kits. After a few years of owning and using this I've found it's great to use a smaller sampler to find the data you're liking for, but I have also found this to not be very accurate and getting different numbers from same batch even same small sampling. I'll check with h2o between samples and the water will be accurate. So in the end just take the bad with the good. It's reasonably priced, easy to use, just sometimes it's not very accurate. This handy tool is great for checking your pre-boil gravity after sparging. It is accurate as long as you read the instructions and calibrate it properly. Re-calibrate from time to time to be safe. The first time I used it (after calibrating) I compared the refractometer reading with a hydrometer reading and they were identical! I was hesitant buying this as many of the reviews regarded the inaccuracy but I have tested it several times against my hydrometer and it has been +/- no more than .002 every time. This is a MUST HAVE if you are making the step up to all grain. Side tip, this are great to use when making a starter as well! No more guessing at your ratios. 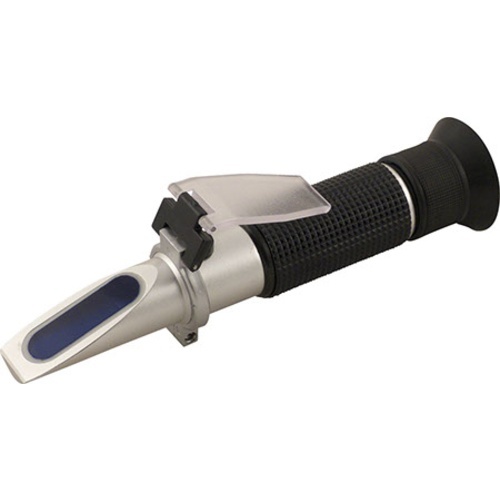 Good price for a dual scale refractometer, holds calibration well and reads accurately. Overall construction is good, and the fitted case is a nice touch for protection. Easy to read with a bright light source, can even take photos of readings with my cell phone camera. Great Product, very easy to use. I purchased this while splurging on a large order. I had never used one prior to purchasing and was taking a leap of faith on this product. After brewing I took a reading and it was VERY accurate. Then I got carried away and took a reading of basic house water and the beer I was drinking, both were completely accurate. This method was extremely easy and allows me to take a reading and not have to pour out beer. Love it! I love this product. Makes it very easy to read wort gravity in both SG and Brix scale. Four drops of wort and you have your reading. No need to take a big sample for hydrometer test and temperature compensation. Just make sure it's well calibrated from time to time. This is a nice, easy to use refractometer. The scale is fairly easy to read, given that it has to fit all that information in such a small area. Very easy to calibrate, and reliable although I'm still doing hydrometer samples until I feel totally comfortable with it. You do have do calibrate before each brew, but it's very easy to take samples thru out the brew and into the fermentation. Refractometers are very useful but I will look for a different manufacturer next time. I made sure to dial it in correctly, but still checked the first few batches with my hydrometer. Some readings sometimes are off though so I just take another. I think the issue was when I added water to bring my batch back up to 5 gallons it was not mixed in evenly. This is an easy upgrade to your standard hydrometer, and you do not waste any precious wort. I rarely use my hydrometer anymore, except for occasional spot checks. Fantastic product! 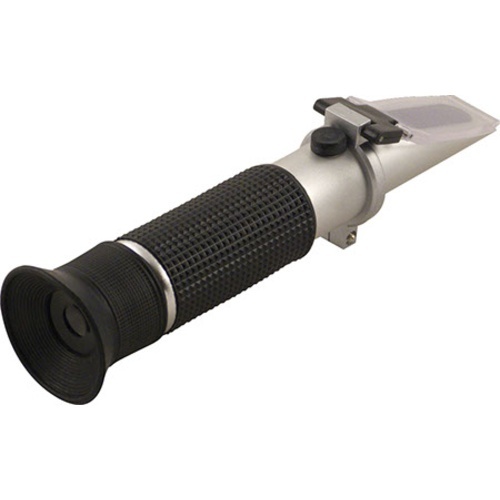 This refractometer has given me great service without any problems. While it may not be the nicest one out there it is certainly a great value for the money. I bought this Refractometer on a BeerDeal and was pleasantly surprised how easy this thing is to use. I was skeptical at first but all that disappeared the first time I used it. Being able to use this Refractometer in addition to or instead of my hydrometer, I have been able to get my readings on point. A must-have for knowing when you've hit your gravity in the brewing process. Very easy to read and clean. This refractometer makes my brew day so much easier! Gone are the days of having to collect enough wort to float a hydrometer, and make sure the hydrometer is calibrated each time due to the paper slipping. Calibrate this refractometer once with some distilled water, lock it down and forget it. Just a tiny bit of wort is needed to get your SG reading to finish out the brew day. Great for quick readings, easy to read. Have been using this refractometer for about 7 brews now, and love the ability to take a spoon and take a sample for reading. I now check pre boil and post boil gravity with a tiny sample. I do not have the best of vision, and find with proper light I can easily take a reading. Hope to afford a nice electronic version someday, but this will do nicely till then. I've used laboratory-grade refractometers in the past - they're great...but for the money, this is the way to go. I use this refractometer almost weekly; it's simple to calibrate (and holds calibration for a long time), and reads well. It may be off by a couple of thousandths, but think about what that translates to...less than 1/10th variance for a gravity. Killer. This refractometer is a huge time saver. Instead taking a cylinder full of wort and waiting for it to cool, use a couple of drops and you have a gravity reading in a few seconds. So now it's practical to take multiple samples to really hone in on changes to my brewing process. Very accurate readings. This is my first refractometer and it's holding up well. It is well made and accurate. I've had no problems with it. I recommend this product. The lines are a little small to read but its seams to be accurate so far. I'm glad I got it. When my other refractometer broke, I did some research and realized most dual scale models are not actually accurate on the SG scale. This refractometer has the accurate scale and works wonderfully. This works great. You still have to pay attention to temperature but a few drops cools a lot faster than a hydrometer container. Easy to read, easy to keep clean, reliable. Easy to read, and reliable. Very easy to read. Works as described. I always cool the liquid a bit before putting on the refractometer. I then give it a few seconds for the sample to cool to the temp of the refractometer. Look through at a bright light source, and you will get a precise line to read from. Was a great deal of the day buy! Get rid of you hydrometer and get this refractometer, you won't regret it. Good for rough number estimates. I know my vision is not as good as it was when I was younger, but this viewer can be difficult to read. I have also had experiences where I get different numbers when taking multiple samples of the same wort. For the price though I get through these inconviences. This is the first refractometer I've ever used/purchased and I am very happy with it. Out of the box I calibrated it, and that was straight forward and simple. My first use with wort I double checked everything against a hydrometer, and all readings were within .002 SG. Once I got familiar with focusing the eye piece with different light sources getting readings has been a breeze. Very happy I made this purchase and would recommend it to anyone interested in improving/speeding up their brewing. Maybe it's just me, but I've always had a heck of a time trying to read a hydrometer. This makes getting and reading a sample much easier. I wanted to step up my equipment and this refractometer was a good addition. I use it to compare the hydrometer results and to also check different stages during brew day. The kids wanted to know what the device was and I was able to demonstrate some science at home. I demonstrated the sugar content of various juices versus just water. The kids could see the SG differences based on the line and we could calculate the sugar content of the juices. Maybe it's user error, but this just did not work for me. I bought it after my hydropeter shattered in my hand, but I think I'm going back... You can measure the same beer and get a completely different result. I use it to measure sugars on mash out, it's a little bit of a pain to clean, i just run it under water and that gets the residual sugar off but otherwise good tool to have. I like the dual scale and the easy of use. Great way to keep track of SG during after the mash. I love this thing! You don't have to worry about braking a hydrometer. Takes just a couple of drops and BAM! You have your gravity reading. Just started all grain brewing this past fall very helpful to check your running's to see if your going to hit your mark. Buy this thing you won't regret it.